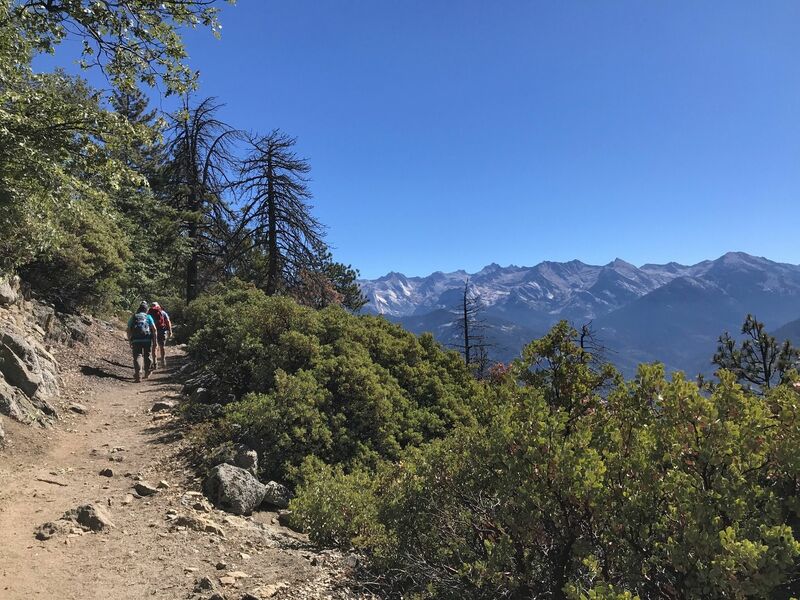 High Sierra Trail: Crescent Meadow to Whitney Portal is a 59 mile heavily trafficked point-to-point trail located near Three Rivers, California that features a lake and is rated as difficult. The trail offers a number of activity options and is best used from May until October. 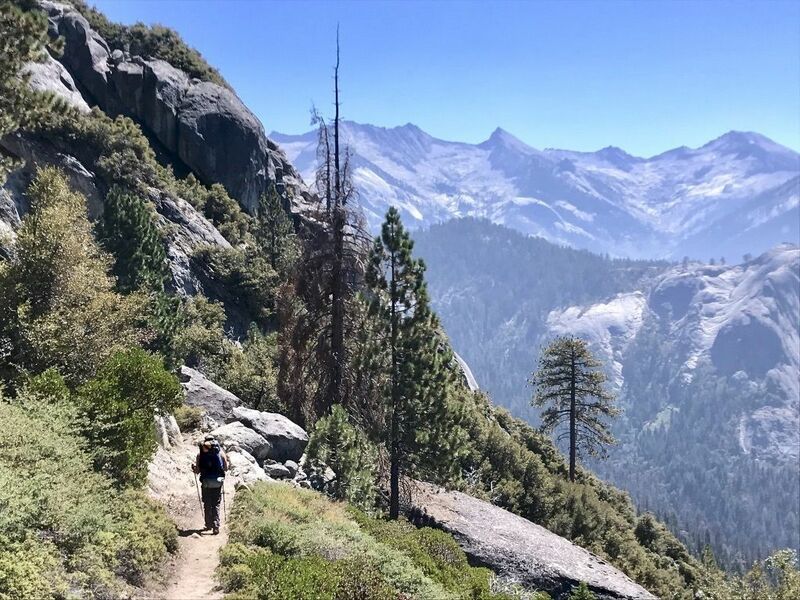 Each paragraph below roughly corresponds to a day on the trail, although there are many ways to break up the hike, and day hikes are also possible. 1. The HST begins at Crescent Meadow, or start from the trailhead at Wolverton. The trail climbs along a steep ridge. To the right, the Middle Fork of the Kaweah River. To your left, the summit of Alta Peak at 11,000 feet. The 1st camp is at 9-Mile Creek - this creek is not labeled as such, but is referred to as 9-Mile because it is 9 miles in. 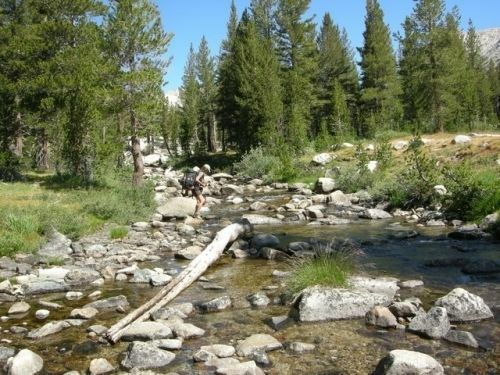 Or, move on to the next creek crossing (Buck) or to the backpacker camp at Bearpaw Meadow. All three have bear boxes. 2. The second stretch is exposed alpine terrain. From Buck, the trail climbs 600 ft to Bearpaw Meadow. Here is a backpacker's camp. For the next two miles, the trail descends from Bearpaw to Lone Pine Creek. You will find a bridge over a gorge but it's another mile until easy water. There are some campsites throughout. Here you find granite formations like Valhalla and Angel Wings. Eventually you reach Hamilton Lake. Stay here or continue up to Precipice and through Hamilton Gorge. This stretch ends at Precipice Lake. 3. 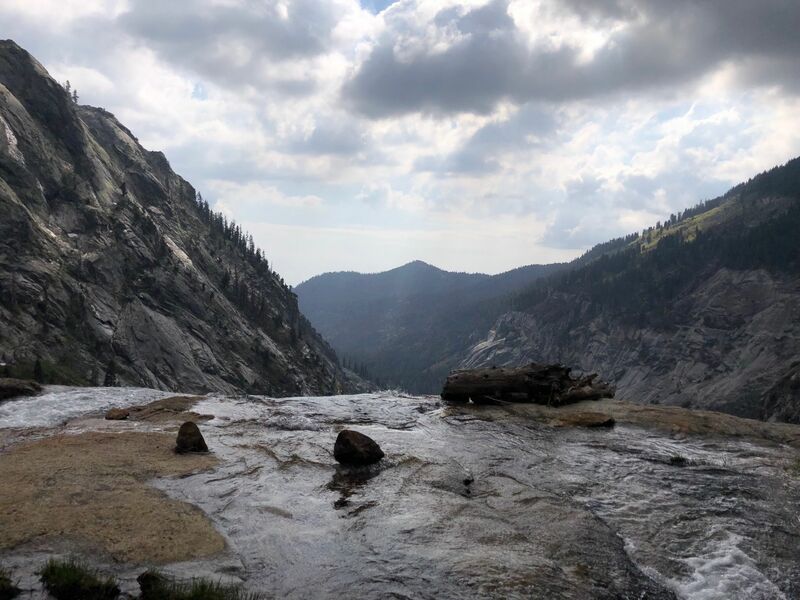 Hike along through a boulder field and past some shallow ponds in an alpine zone. 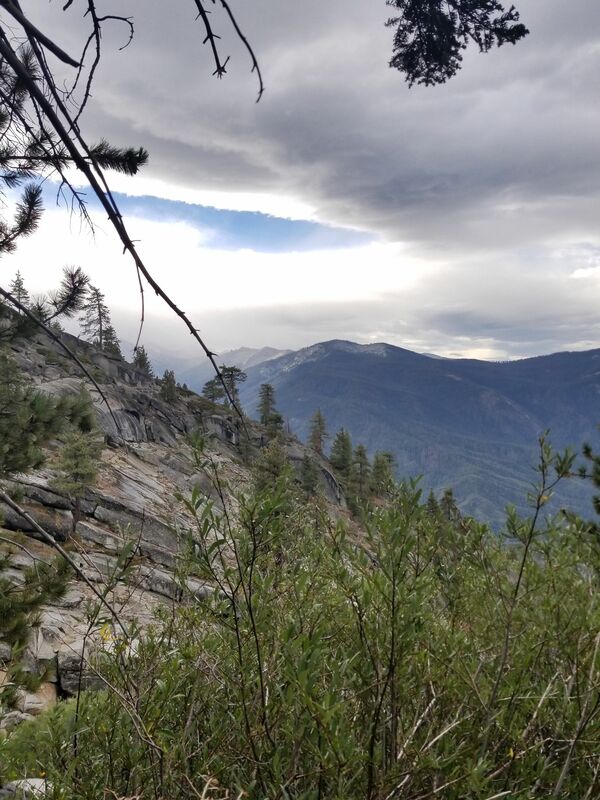 A mile in you'll be standing atop Kaweah Gap, the pass which marks the trail's crossing of the Great Western Divide. 9-Lakes basin is to your left, but to stay on the trail descend to your right into Big Arroyo. The trail descends through Big Arroyo for several miles, eventually meeting a trail junction near an old patrol cabin. There are many campsites scattered. This junction is the beginning of a gradual, hot climb out of Big Arroyo. It is the driest stretch of the trail so fill up on water in the Arroyo. As you climb you'll get views of the southern peaks of the Great Western Divide before entering the forest atop Chagoopa Plateau. Eventually, if you choose the right fork at the trail junction, you'll arrive at Moraine Lake, a great place for a swim and camp. 4. 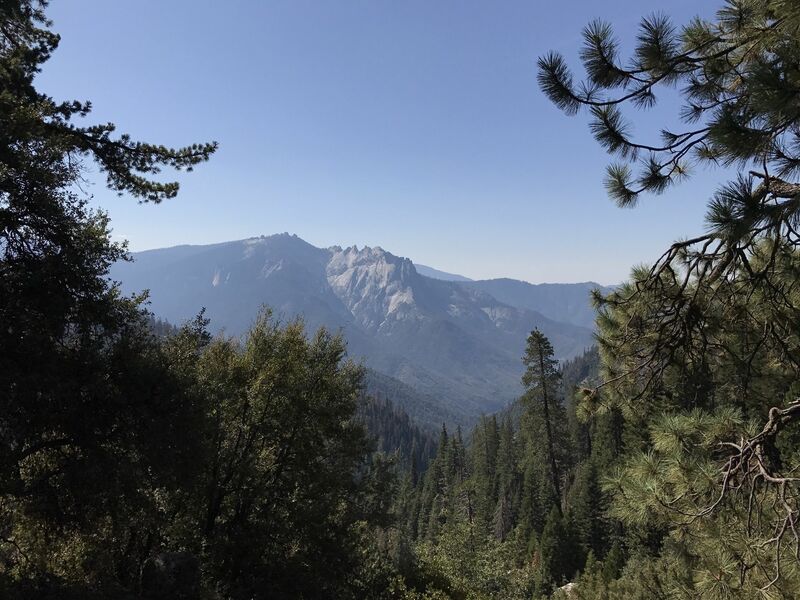 For the first few miles of this stretch you'll get to enjoy easy hiking as the trail winds gradually through the woods with no steep ascents or descents. If you have a sharp eye, keep a lookout for Mount Whitney in the distance. It's not a clear view, but it's the first peek you'll get of the highest point in the lower 48 states, one you'll hopefully be standing on in a few short days. 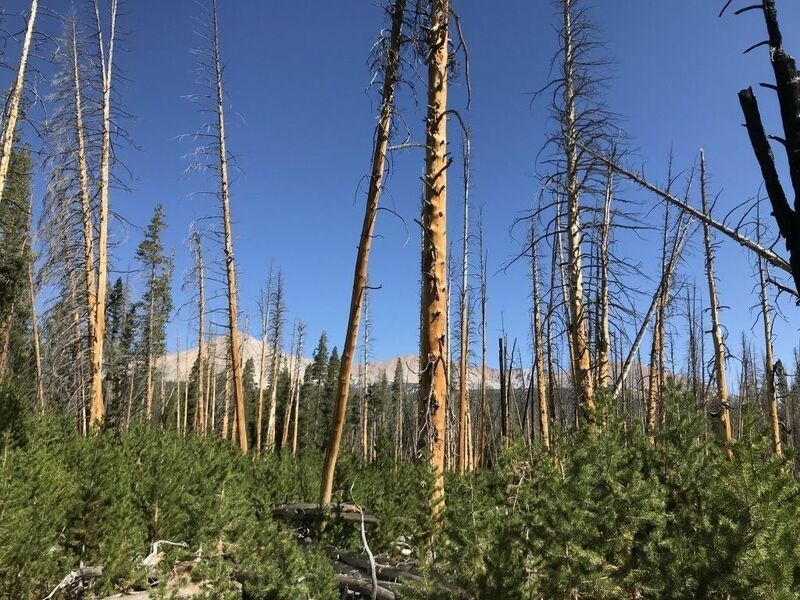 You'll pass the remains of an old sheep herder's cabin and through a forest of burnt tree trunks. Eventually you'll hike along the southeastern edge of Sky Parlor Meadow with an unobstructed view of Mt Kaweah. 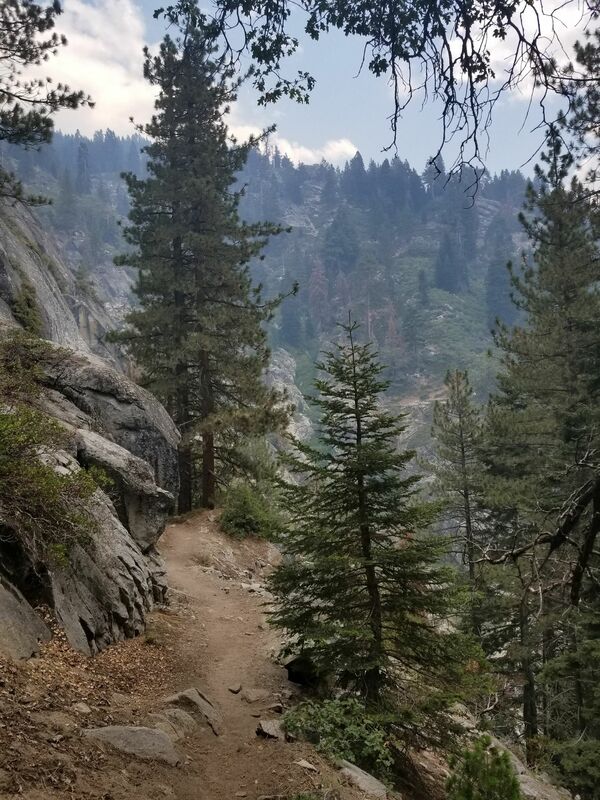 After joining back together with the other fork of the High Sierra Trail, the long, ~2500 foot descent into the Kern Canyon begins. It starts off moderate but turns into tight, rocky, steep switchbacks. Before the switchbacks, the trail passes through a dense field of ferns - this is where you need to go on rattlesnake alert. They are common here and on the upcoming stretch of trail. 5. 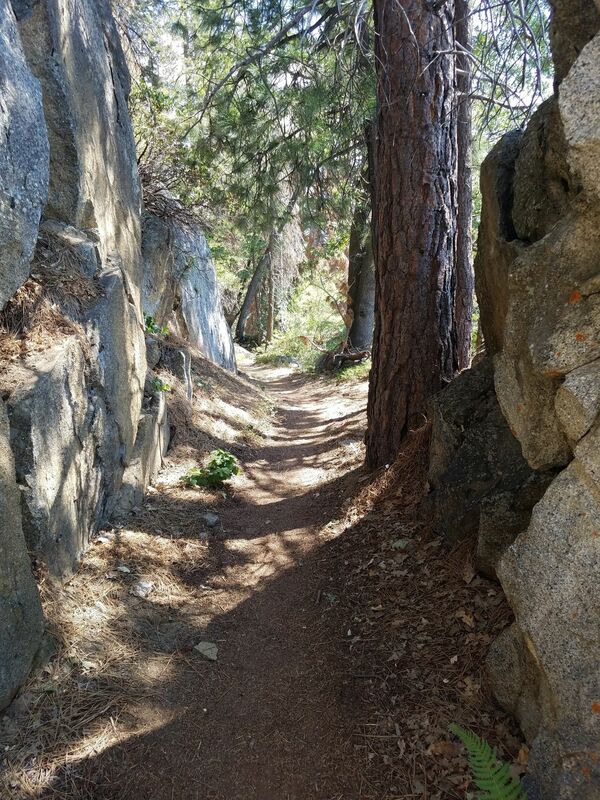 Next is a simple and easy stretch at the midpoint of the High Sierra Trail. The trail parallels the Kern River, climbing gradually through the Canyon. You'll have plenty of water access. 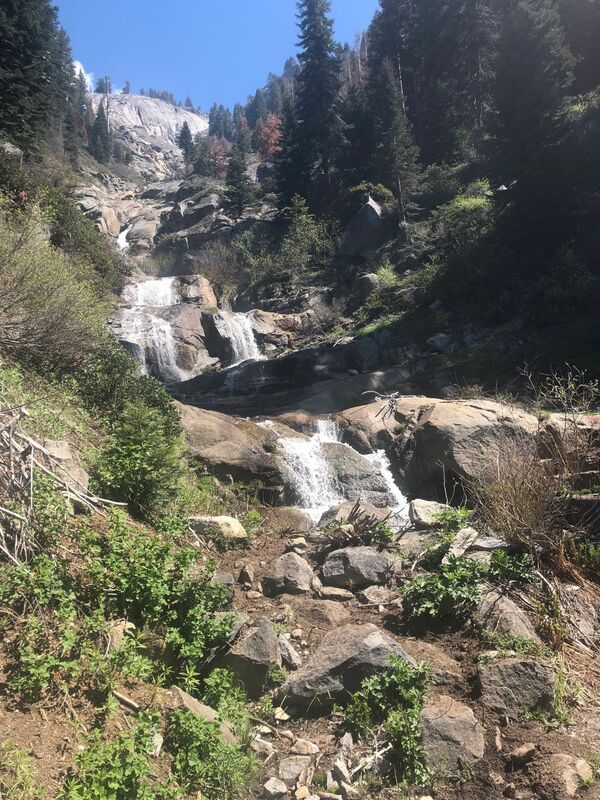 Approximately eight miles from the Hot Spring you'll reach Junction Meadow, the not-so-cleverly named open space where other the High Sierra Trail meets the trail to Colby Pass and other destinations to the west. There are many campsites at Junction Meadow. From here, the trail follows the right fork of the Kern River and starts to climb. Before too long you'll reach the junction to Wallace Creek. The High Sierra Trail continues to the right with a sign informing you of the short 14.8 miles left until Mount Whitney. There are a few campsites if you continue straight towards Upper Kern Basin. 6. This segment goes a western-approach climb of Mount Whitney: Guitar Lake. This is a stretch that climbs about 3500 feet in ten miles. Upon meeting Wallace Creek (which is far below you), the trail turns to the east until you eventually meet it at the junction with the JMT. 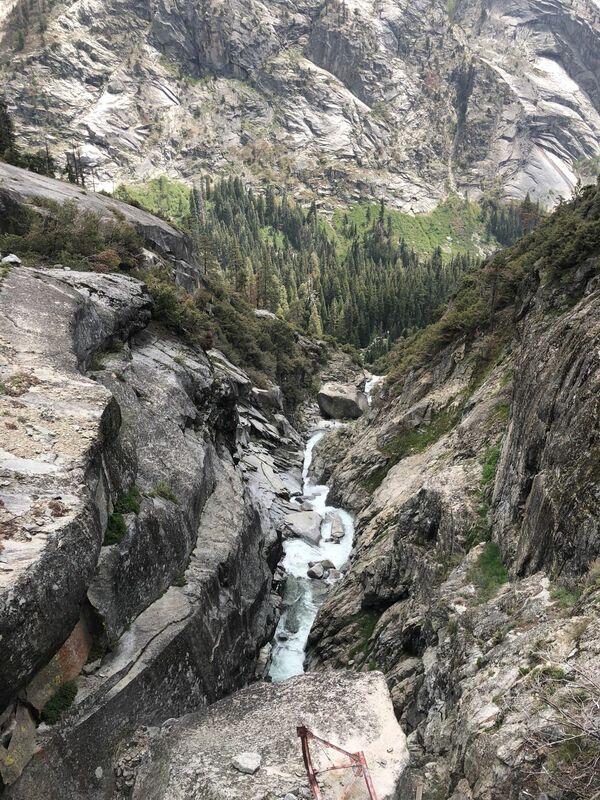 About 3.5 miles in the High Sierra Trail meets the John Muir Trail where it crosses Wallace Creek. At the junction there are many campsites. Finally, you'll reach Crabtree Meadow where there is a backcountry ranger station, places to camp, and water access. From here, the trail climbs another ~800 feet in 2.5 miles to Guitar Lake at 11,400 feet. 7. The summit of Whitney is about a 3000 foot climb from Guitar Lake. The first 2.5 miles and 2000 feet switchback up the western side of the ridge until reaching Trail Junction. Here, drop your pack (keep your food protected from marmots! ), grab your camera and water, and head to the summit. The summit is another 1000 feet up in about two miles. After summiting, it's about 11 miles and 6000 feet of descent to the trailhead. Back at the Junction, pick up your pack and climb the final small stretch to Trail Crest, then descend the famous 97 switchbacks. 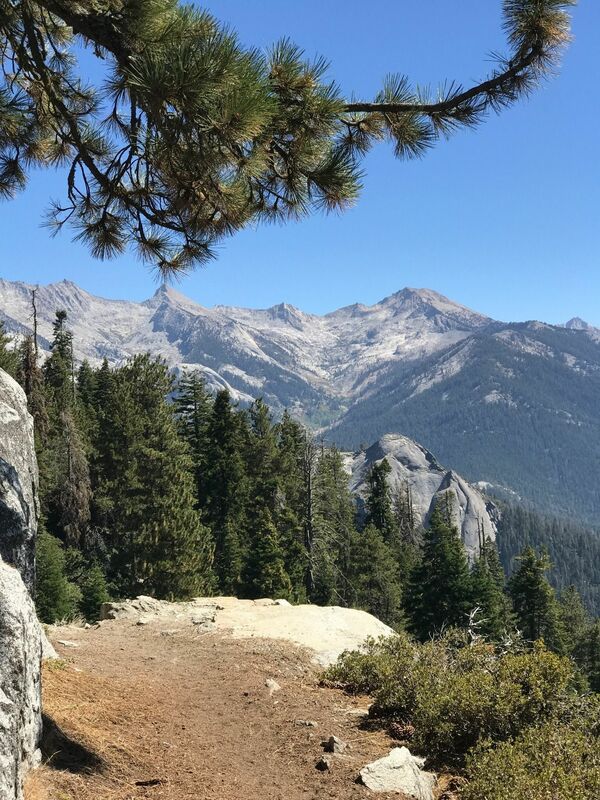 This trailhead is an optional starting point for the High Sierra Trail. Fewer people at this trailhead means better permit availability. There is a restroom with running water and a large parking area here but very little else so the crowds are sparse. The trail starts from the northern side of the large parking lot. Bear boxes and garbage bins are provided. This is the official Starting Point of the High Sierra Trail! 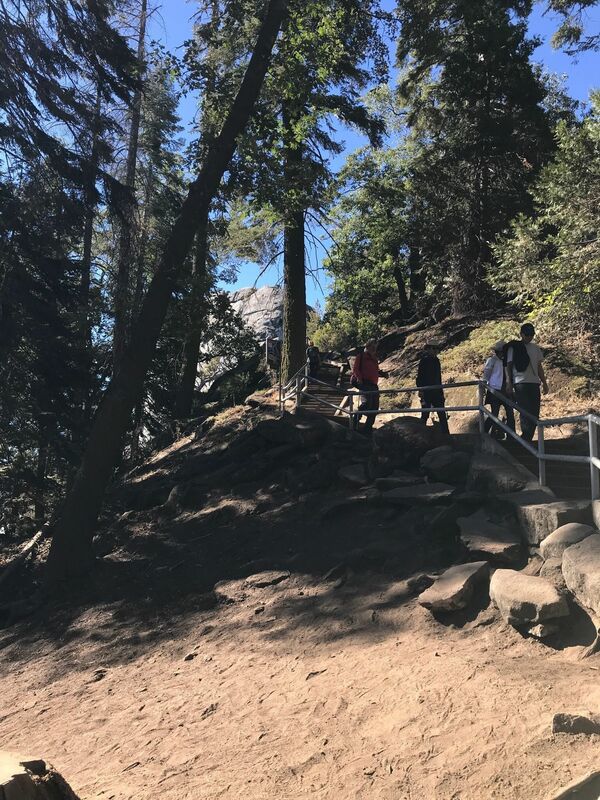 The Crescent Meadow Parking area is beyond the Moro Rock trail and also features a picnic area (and the accompanying crowds). No camping is allowed until you get at least 2 miles beyond the trailhead, but finding a campsite sooner than the 9-mile mark is difficult. Once advantage to starting at Wolverton over Crescent Meadow is the visit to Panther Gap. From here, you get a great view into the Great Western Divide and the terrain you'll be crossing over the next few days. It also roughly marks the end of the climb from the trailhead - the next stretch will take you down to meet the official High Sierra Trail. There is a dry campsite here at Panther Gap (no water). On the way to meet the official High Sierra Trail, the trail switchbacks across Mehrten Creek a few times so there are opportunities to fill up the bottles when the creek is running. Note that this could be dry later in the season. In August, a large variety of wildflowers bloom through here. 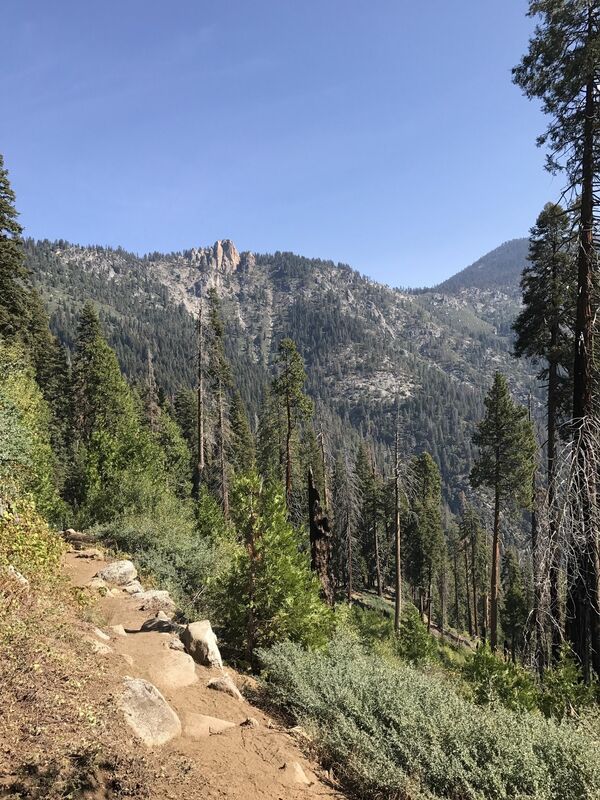 If you are coming in from Wolverton, this is where the trail meets the official High Sierra Trail. There is a water source about 100 feet down the trail to the east (likely dry later in the season). For the next few miles the trail offers some amazing views towards the Great Western Divide as it wiggles in an out of creek drainages. 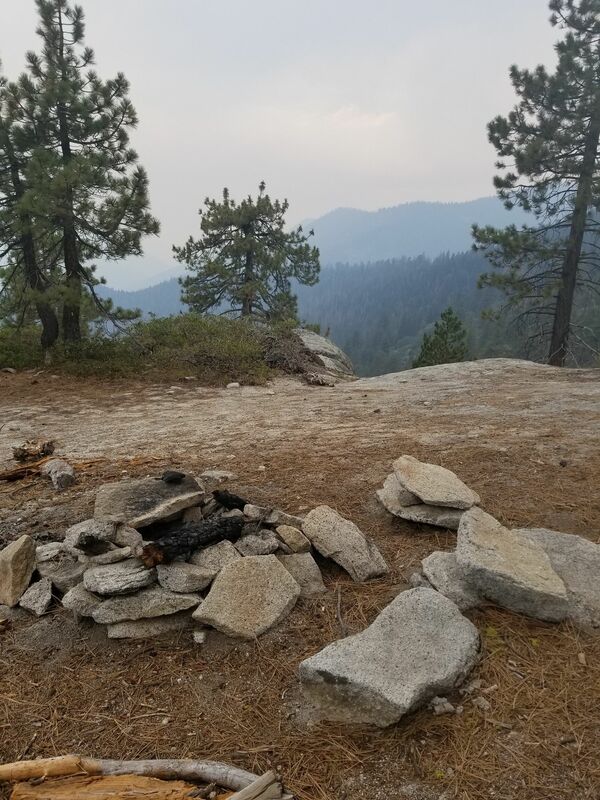 This is the first established camping area along the High Sierra Trail. There are a couple of places to pitch a tent, but platforms are mostly slanted. Expect a crowd. There is a bear box here, but you should also be carrying a bear canister - bears are very active at this site! 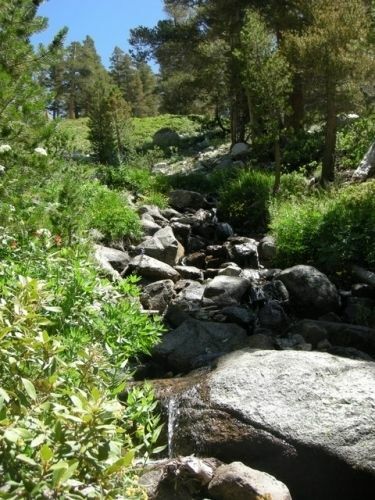 Buck creek is the second campsite opportunity along the High Sierra Trail. Here, the terrain is a bit more open than what is found at 9-mile creek. There are a few places to pitch a tent and a bear box to help protect food. Bears and marmots are active in this area. There is a bridge across the creek - no need to worry about a crossing here. 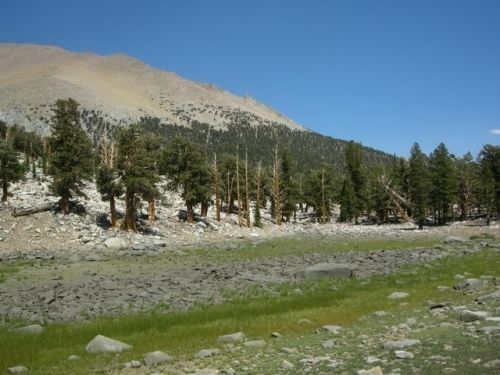 Bearpaw High Sierra Camp is the last outpost of civilization along the High Sierra Trail. Here, people who want to pay a lot of money can live the life of backcountry luxury with tent cabins, a camp chef providing fresh and hot meals, and running water. But although these things aren't for us rugged backpackers, there are some opportunities here. A backpacker's camp offers plenty of space to camp and several bear boxes. There are pit toilets for backpackers (flush toilets are for paying guests) and a water pump for easy water access (as of 2009, the water from this pump still needed to be treated). When approaching Bearpaw Meadow the signs can be a bit confusing. Once you gain the saddle after the climb out of Buck Creek, the first junction leads to the backpacker camp to the right, and the High Sierra Camp straight ahead. If you are not camping here and just passing through on the HST, stay straight. As you approach the High Sierra Camp a backpacker's pit toilet is the first 'building' on the right. The water pump is straight ahead. At the High Sierra Camp, the main building has a wonderful front porch from which you can view the Great Western Divide. It is also the first time you realize the reality of the huge climb you have in front of you! If you're lucky, you may hear some music coming from the ranger's cabin or take in the smell of fresh brownies from the kitchen. After leaving the High Sierra Camp the trail winds gradually downwards, passing through a colorful assortment of wildflowers. It's a bit discouraging to lose this elevation while staring at the big climb ahead, but the scenery has now opened up and towering rocks and deep canyons are a nice distraction from those thoughts. At this waypoint the trail crosses a bridge across Lone Pine Creek. The bridge sits high above the water which is rushing through a rocky gorge. There is NO easy water access from this crossing! When on the bridge, stop and look below the bridge on the downstream side. Below you lies the mangled remains of a previous bridge - luckily the new one is much more solid! This crossing also marks the end of any descending trail for a while - and the start of the climb. After about a mile of dry hiking from the bridge, this water crossing of Hamilton Creek provides a perfect opportunity for a water refill and a foot soak. The trail crosses this creek at the top of a waterfall and the view is spectacular. This is a backpacker's dream destination. Campsites abound at this lake, complete with bear boxes, and even an open-air pit toilet. It is often used as a basecamp for the trail crews working on the rugged trail above, so make sure to stop and say thanks if you see them. Hamilton Lake is a perfect place for a swim and fish, with a beach-like area to lull you into a long rest if only passing through. Across the lake you can watch the cascade of water falling from the higher lakes, surrounded by the giant mountains like Valhalla. If you started off the day at 9-Mile Creek or Buck Creek, you've climbed about 2000 feet already. Although it isn't a long distance, many people choose to camp at Hamilton since the next campsite opportunity requires a long ascent. 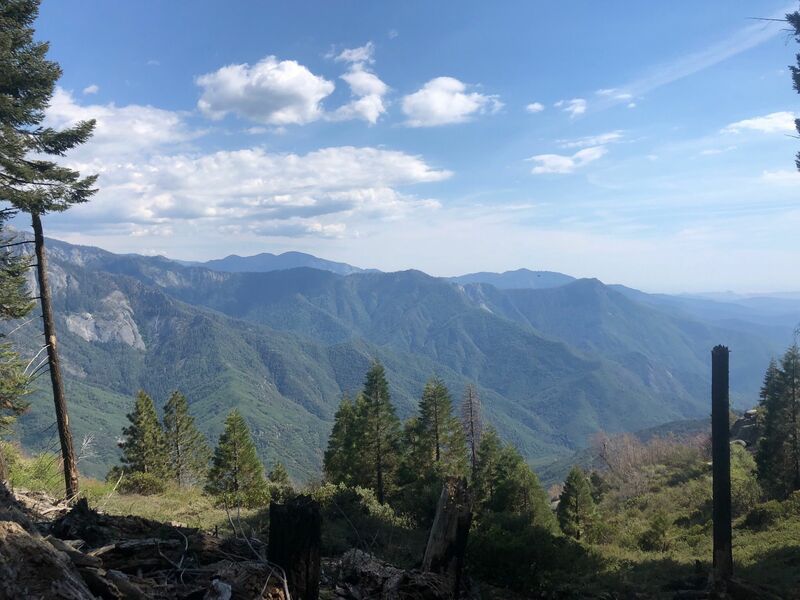 From here, it is approximately a 2500 foot climb to Kaweah Gap so if you are continuing on, this is a great place for a long rest to recharge the batteries. Here is the famous High Sierra Trail tunnel. Blasted out of solid granite, this tunnel was built after attempts to build a bridge across the gorge failed (pesky avalanches). You will still see the cables and concrete footings for the attempted bridges, but now the trail is cut out of the solid granite. The trail is wide and spacious along here, but people with a fear of heights may feel their heart rate increase a bit (if it's not already pounding from the climb). This can be a tricky section in the early season - snow and ice lingers in this shadowy canyon and you may have to negotiate some of it. 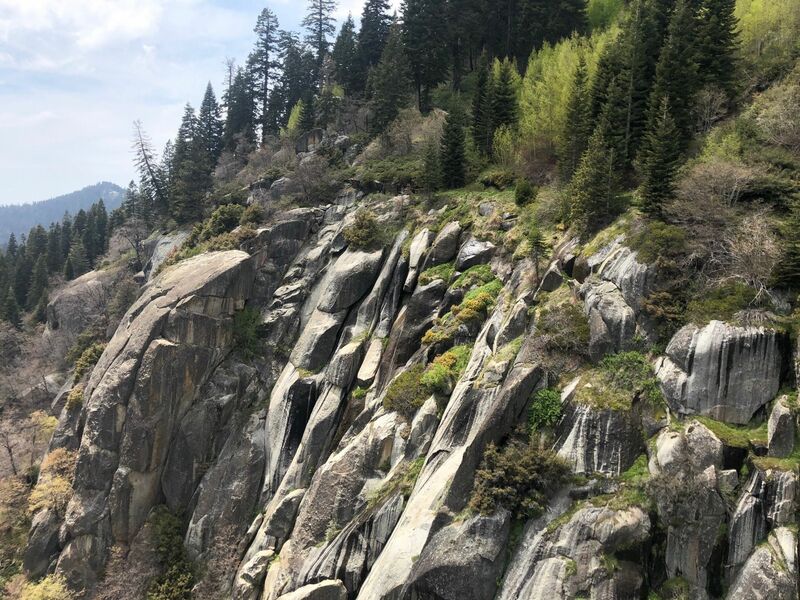 You'll probably see trail crews along this stretch - the trail is under constant maintenance due to the regular rockfall damage that occurs throughout here. While this entire segment scores high on the 'wow' charts, the best view is found here. 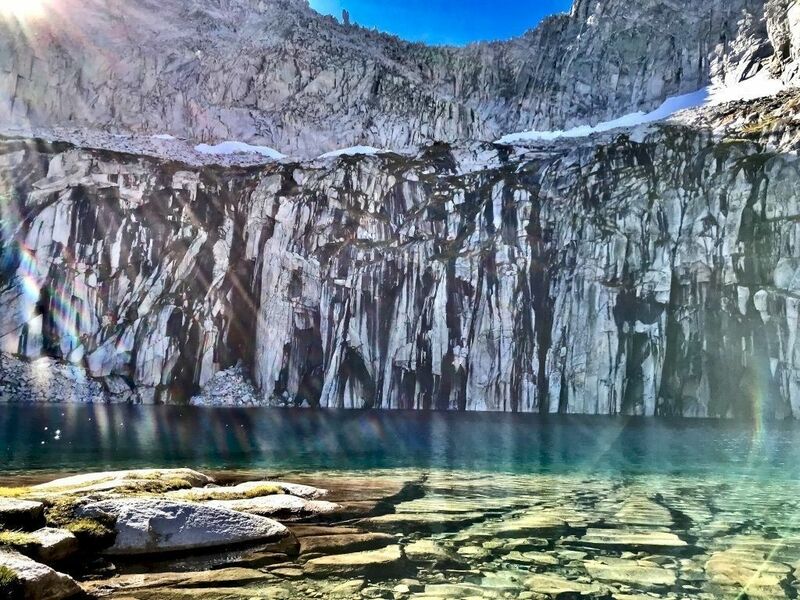 Made famous by Ansel Adams' "Frozen Lake and Cliffs", Precipice Lake is one of the jewels of the Sierra. You'll love to fill your water bottles in its pristene, cold water. Snow lingers here well into August and you may hear the 'whump' of pieces falling off the snow field and into the lake. On the far side of the lake, a sheer granite wall is painted in patterns of green, black, and grey provided by the glacier melt, plants, and rock. 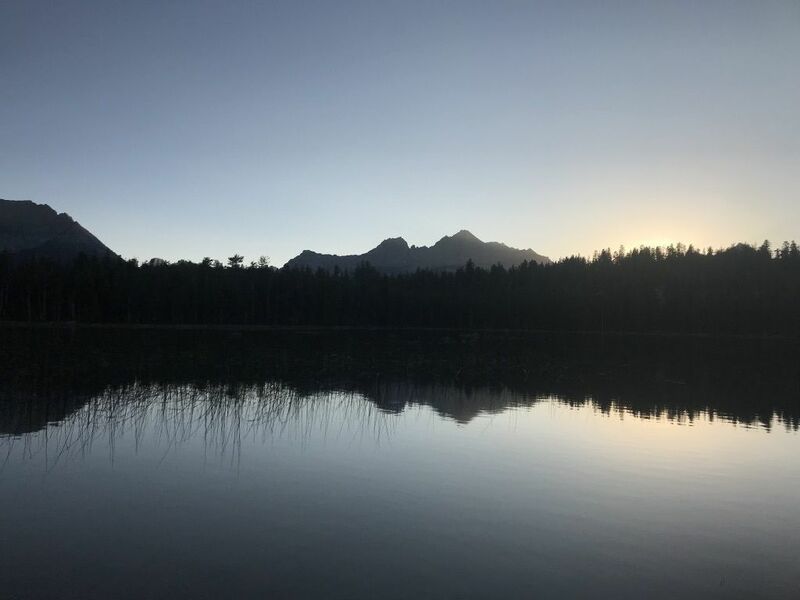 As the sun moves across the sky throughout the day, the colors in the lake change from greens and turquoises to blues and greys, golds and coppers at sunset, finally fading to a midnight blue and solid black. Surrounded by a boulder field, Precipice is not an easy or particularly hospitable place to camp, but it has been done. There are few to none places to pitch a tent, but bivying is possible. 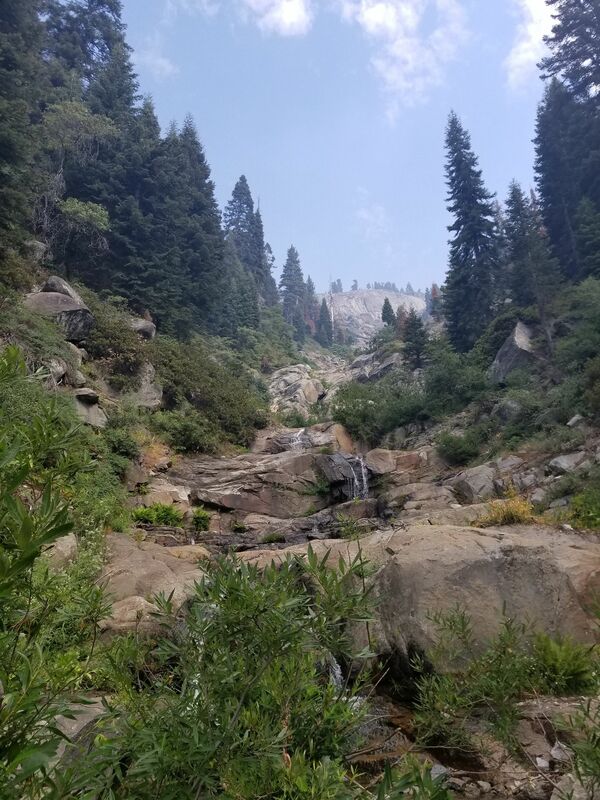 As you descend into Big Arroyo you will see some opportunities to camp and refill your water, but this is the first big creek crossing where you will likely be able to reliably find water later in the season, and you'll probably get your feet wet earlier in the season. There are nice granite slabs around here that are just asking you to sit down and take a break. There is a hole that is packed with little brook trout so if you've brought a fishing pole along it's worth a few casts. 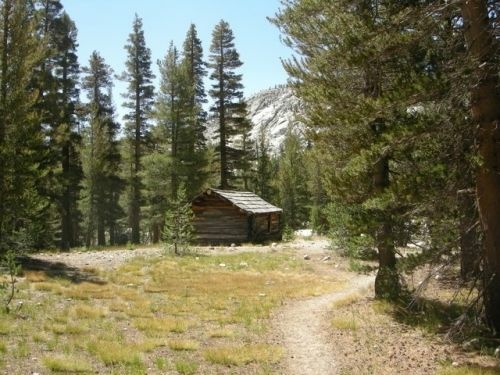 While not exactly *on* the High Sierra Trail, this cabin is about 500 feet down the trail to Little Five Lakes. It's worth a quick side trip, and also offers some nice campsites (including bear boxes). This is an old cabin that is still standing strong. It is not open to the public; it is used by the park service as a Patrol Cabin/SAR headquarters. Unfortunately, information on the history of this cabin is lacking, but it's likely a remnant of when this area was used by sheep farmers long before becoming a National Park. Later in the year, this may be your last water source until Moraine Lake (approximately 7 miles away) so tank up! While not a particularly long or steep climb (by Sierra standards), the trail out of Big Arroyo is hot and exposed. You will go through a lot of water, especially if hiking this stretch mid-day. There are a few creek crossings on the map (this POI is the biggest), and while they are a good source of water for most of the season, you should not rely on them in a dry season or later in the summer - make sure to fill up before starting up. This is an odd little spot on the trail. USGS maps show a lake at this location, but the lake has long been dry. What now exists is a dried up field of boulders that is slowly being overtaken by grasses. In other words, do not rely on this as a water source. The next reliable water source is Moraine Lake or Chagoopa Creek. The trail splits at this junction. The official High Sierra trail route goes to the left, following Chagoopa Creek. To the right, the trail will take you past Moraine Lake. In either case, they join back together in a couple of miles in Sky Parlor Meadow. Most people actually take the Moraine Lake fork since the lake is a nice destination for camping. Moraine Lake is a nice destination for camping and offers a bear box, lots of space to spread out, and a nice temperature for swimming. 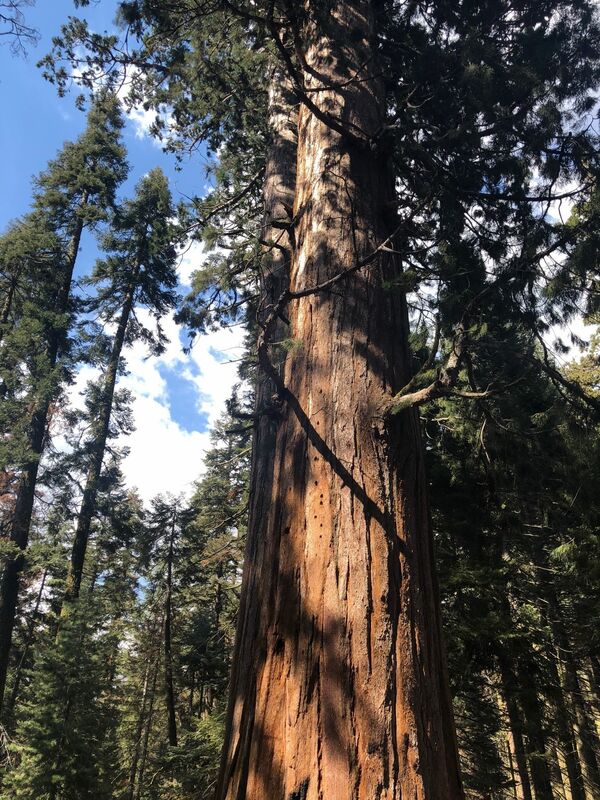 Tall pines keep the area shaded and cool which can feel nice after the sun-exposed hike through Big Arroyo. Moraine Lake's beauty shines at sunrise, so if camped here, don't miss it! Fill all your water bottles here before departing. Although on paper this next stretch looks easy since it is all descent, it is very hot, dry, and exposed. There is no water access until the bottom of the canyon. 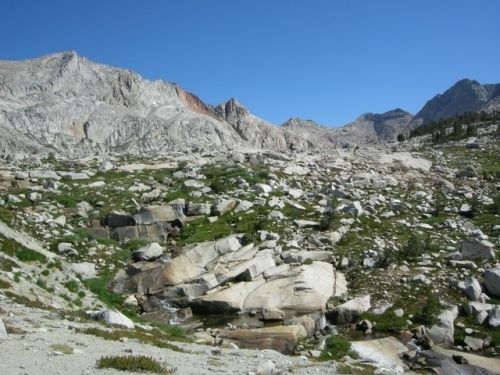 After leaving Precipice Lake, the trail gradually climbs the last 300 feet to Kaweah Gap. 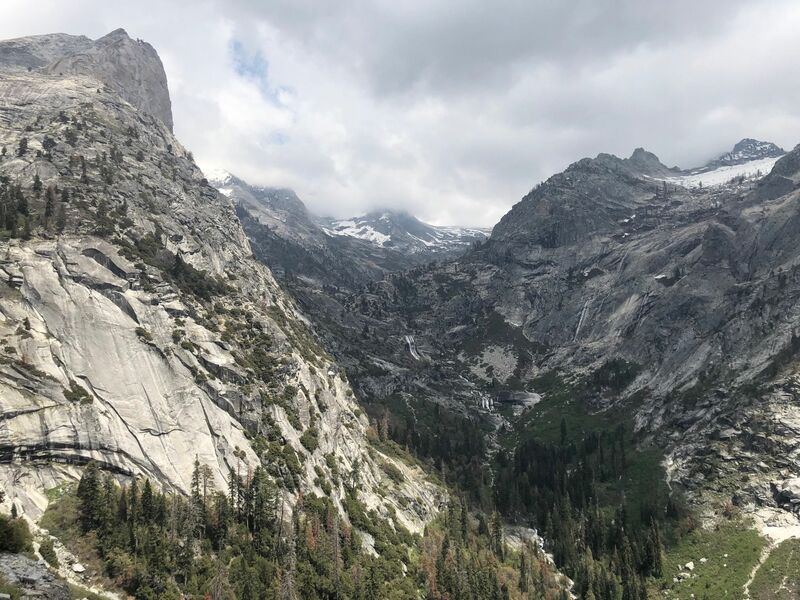 The Gap marks the end of the long climb and is where the High Sierra Trail crosses the Great Western Divide (which divides the watersheds of the Kaweah, Kern and Kings rivers). 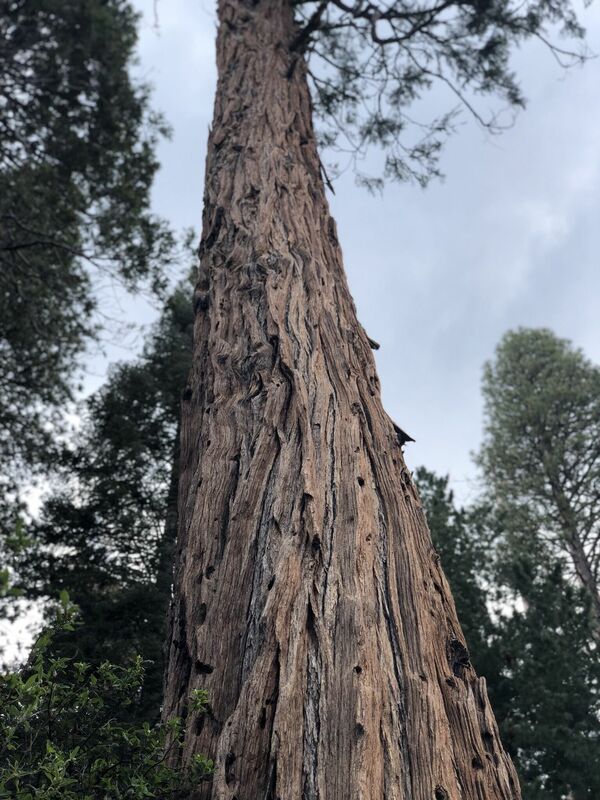 At the Gap, look for the nearby plaque honoring Col. George Stewart, founder of Sequoia National Park. The peak to the north of the Gap is named after him. From the Gap you experience the view down Big Arroyo to the Southeast, and a peek into 9 Lakes Basin to the north. Across from you are the Kaweahs, one of the many sub-ranges in the Sierra. 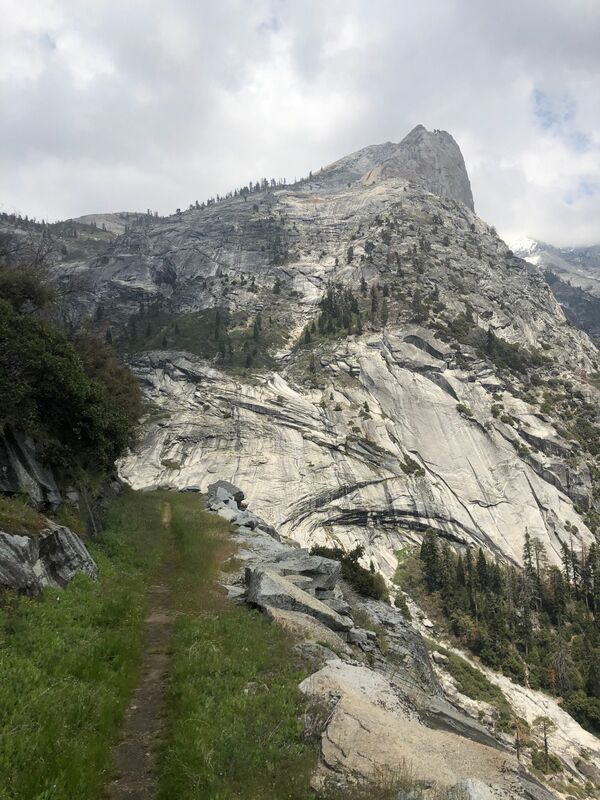 The High Sierra Trail descends from Kaweah Gap into Big Arroyo. 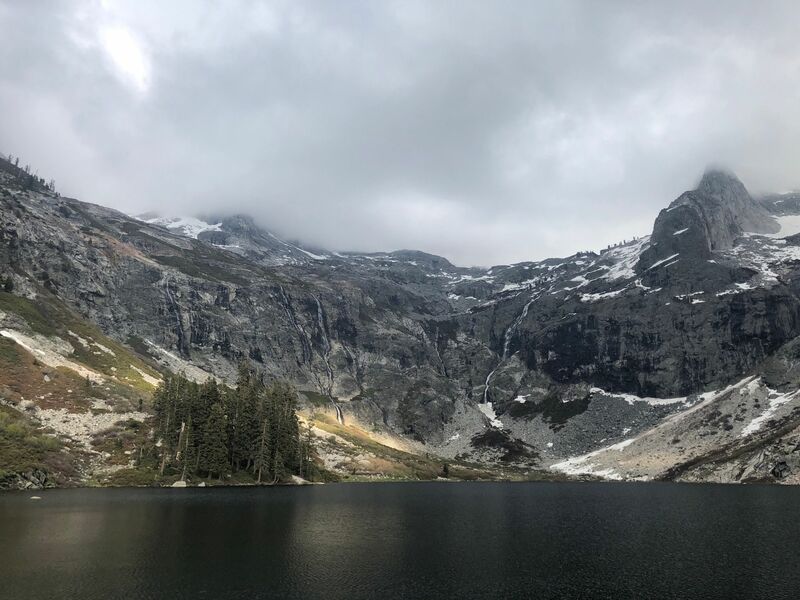 If you want to camp at the heart-shaped lake just below the Gap, descend a few switchbacks and approach it via an obvious cross-country route. This is where the two forks of the High Sierra Trail join back together. 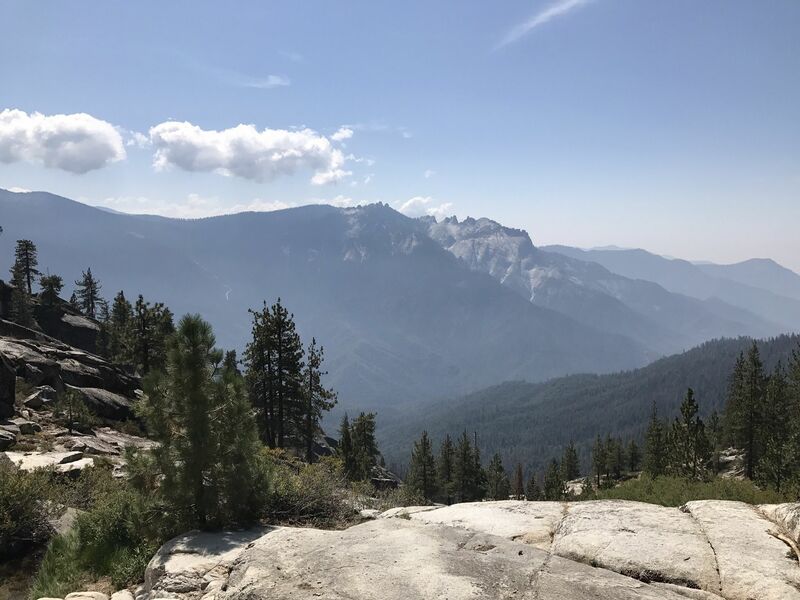 Take in the view at Sky Parlor meadow and prepare for the upcoming steep descent. The upcoming terrain is friendly to rattlesnakes, so watch out! After the steep descent into Kern Canyon you'll reach this trail junction. If you turn to the right you'll be able to access a campsite at Upper Funston Meadow. This campsite is overused by horse packers and not in the greatest condition. 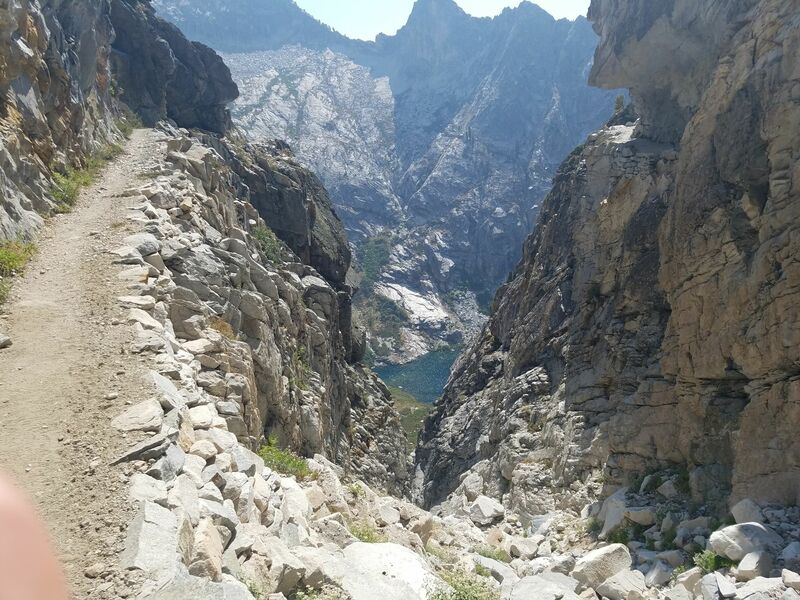 To continue on the High Sierra Trail go through the gate to your left. It is about a mile to water. After the long, hot descent you'll enjoy this creek crossing. The trail between the junction and here has some stretches of foot-bruising and ankle-twisting cobblestone so the opportunity to soak your feet might be irresistible. You'll hear Chagoopa Falls above you but you won't see it from here. Once you've gone a short distance and emerged into more open terrain, turn around to see Chagoopa Creek tumbling down from the ridge above. The Kern River rushes through the canyon and you might wonder how you will be able to cross it. Well no fear - there is a nice bridge that crosses the river about 1/2 mile before the hot spring. This is another easy place to get water. 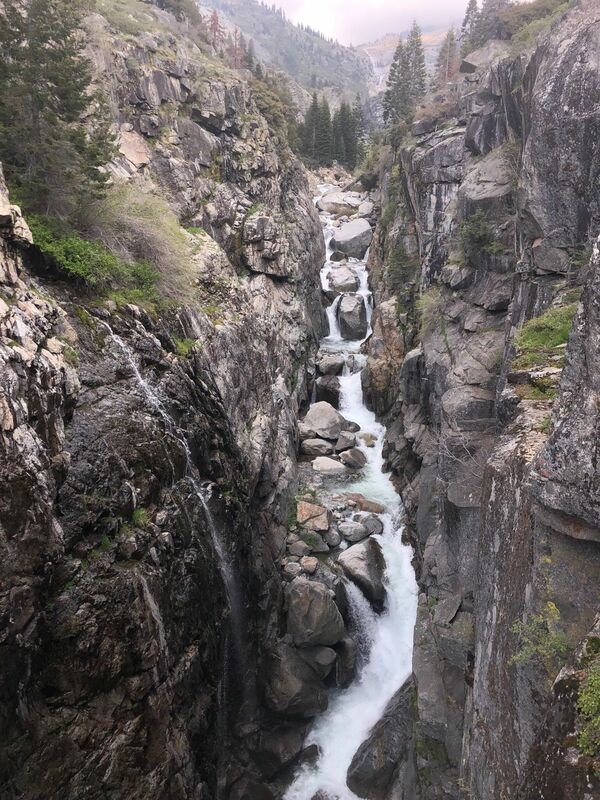 Enjoy the open views through the canyon - Chagoopa Falls, the granite walls, the rushing river. It is hot in the sun-exposed areas of the Kern Canyon, but the river is a great place to cool off. The Kern Hot Spring is a natural hot spring a few feet from the Kern River. The water from the spring is 115 degree F (46 degrees C)and there is a basic concrete tub built near the source. There is a larger pool in between the hot spring and the river that allows the water to mix to a more comfortable temperature. After a few days on the trail this is a perfectly wonderful place to stop and enjoy yourself. There is no camping at the hot spring, but a few hundred feet down the trail you'll find campsites and bear boxes. You'll also find a lot of people out here, considering the distance from the nearest trailhead. Many people use this spot as a layover day. At night, cold air settles into the Kern Canyon, making for quite a contrast with the heat of the day. If it is too hot to really enjoy the hot spring during the day, a morning visit is perfect! The hike through the canyon can be extremely hot, but hiking it in the morning allows you to stay in the shade for a long time. Soon you'll be climbing into the high country, so if you want one more night in the comfort of the thick forests below treeline, Junction Meadow is it. There are many campsites here and flat area to spread out. 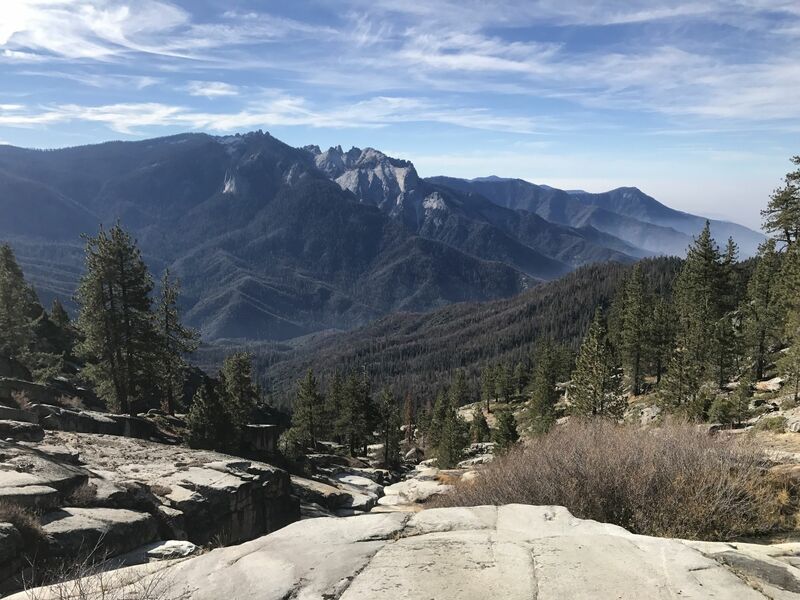 From here, the trail climbs out of the canyon on the start to the long climb to Mount Whitney, 16 miles and net 6500 feet above. The trail from Junction Meadow is hot if hiked mid-day. There is no water access at this junction, even though you can hear the Kern River nearby. The trail is lined with thick manzanita so finding a route over to the water isn't very easy. 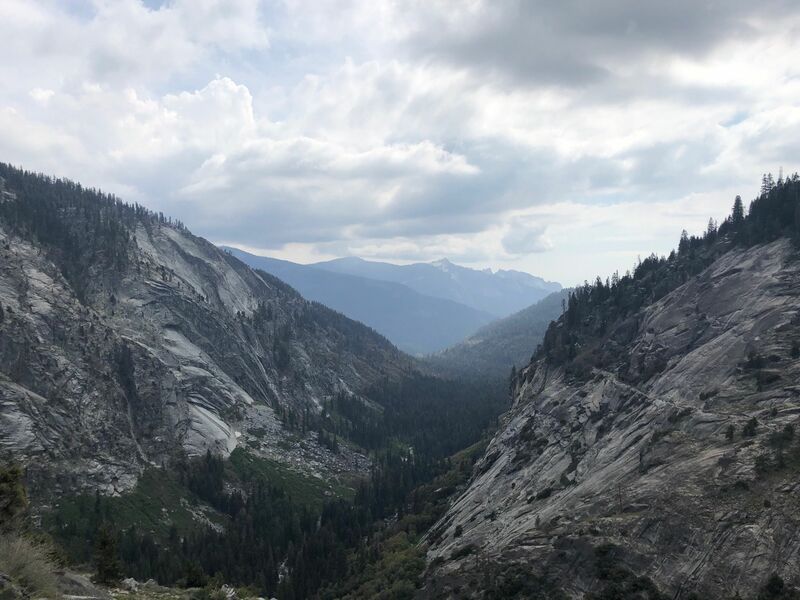 From this junction, the High Sierra Trail continues to the right where it will meet the John Muir Trail in approximately 3 miles. If you continue straight ahead there are a couple of okay campsites and better water access. Don't miss the turn in the trail towards Wallace Creek! There are excellent views down the Kern Canyon on this stretch of trail. There is an old sheep herder cabin here, marking a campsite with a scramble down to the water. It's not the easiest water access, but if you drank more than you expected on the hot climb from Junction Meadow, this is a good spot to fill the bottles. 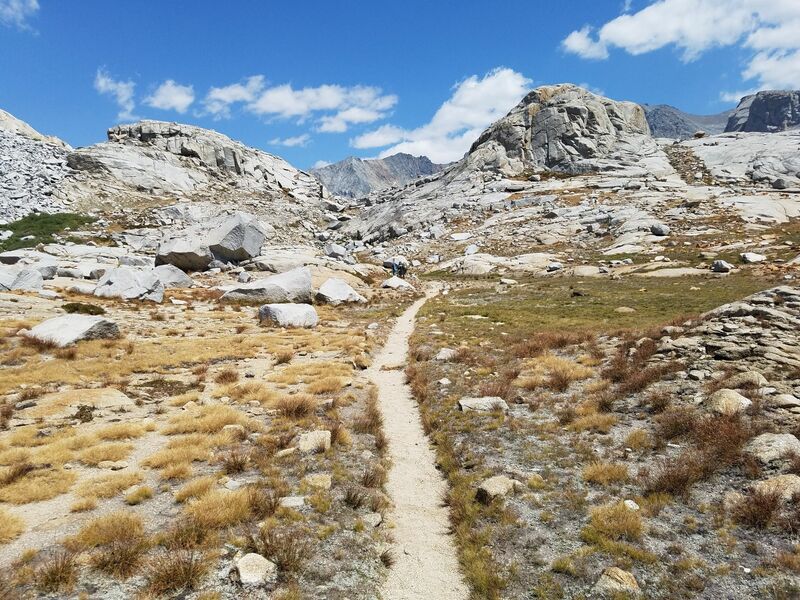 From this point on, the John Muir Trail and the High Sierra Trail are one and the same. Traffic will increase, but you are nearing Mount Whitney and so does the excitement. Fill up your water here - the next reliable source is at Crabtree Meadow. There are also campsites near this junction. The track from the actual trail does not exactly match the USGS maps, so I marked this junction with a POI. The junctions are clearly signed, however, so it is not confusing - just unexpected if you are glued to the map. It's now only 8.6 miles to the summit of Mount Whitney! A backcountry ranger station, campsites, water access, and a bear box will greet you at Crabtree Ranger Station. It's the closest sign of 'civilization' since you left the Bearpaw Meadow High Sierra Camp several days ago. At the junction, make sure to pick up your Wag Bag. From this point until the end of the trail, you are required to carry out everything including your solid waste. Wag Bags provide the most sanitary way to do this. You will regret not having it should the need strike you between now and the trailhead. 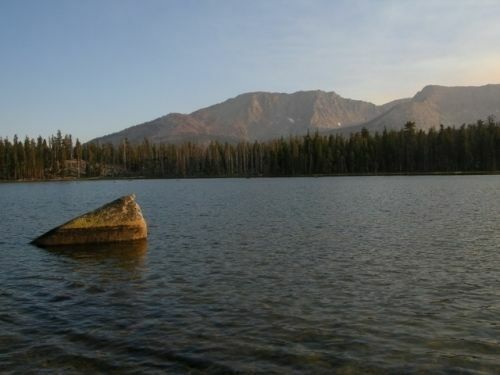 Due to overuse Timberline Lake is under restoration and doesn't allow camping. It's a nice spot to stop and rest, however. The trail is now passing the 11,000 foot mark, and even having been on the trail for a while, you'll likely feel it. Directly to the east you'll be staring at the back side of Mount Whitney. It won't be long until you're standing on the top! The destination of this stretch: Guitar Lake. Most hikers stay here and prepare for an early morning start on Mount Whitney the next day. At 11,400 feet Guitar Lake is a high camp far above treeline with little protection from the wind and cold. However, the beauty of this place makes it worthwhile. Named the Best Place to watch a Sunset by backpacker magazine, you won't be disappointed. Towering above you is Mount Whitney (though the summit is out of sight), and the peaks of the Kaweahs poke out to the west. Use lots of sunscreen here - the air is thin and there is no where to escape the intense sun! Starting early from Guitar Lake is a good way to cover this stretch in a day. By early, I mean pre-sunrise. Most camps will be stirring by 5 AM at the latest. The trail is easy to follow with a headlamp, and if there is a bright moon reflecting on the white granite the headlamp might not even be necessary. One of the most memorable experiences I've had on the trail is watching sunrise from the climb to Whitney from Guitar Lake. As the sun slowly hits the peaks around you, you'll realize you are looking *down* on many of them. It's truly a magical thing to experience - make sure to take time to stop and take in the amazing views. 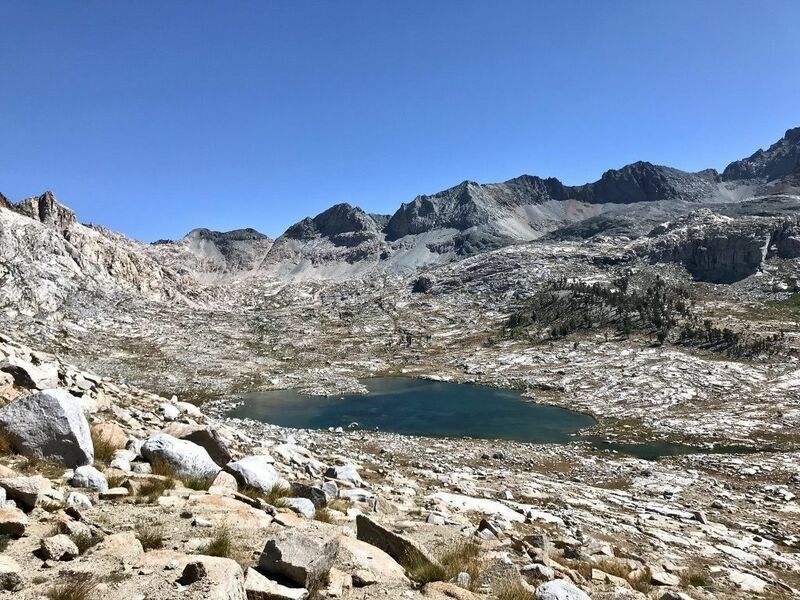 After climbing up the switchbacks from Guitar Lake, you'll reach the junction of the spur trail to the summit of Mount Whitney. Many people choose to drop their heavy packs here and continue to the summit with only a camera and water. 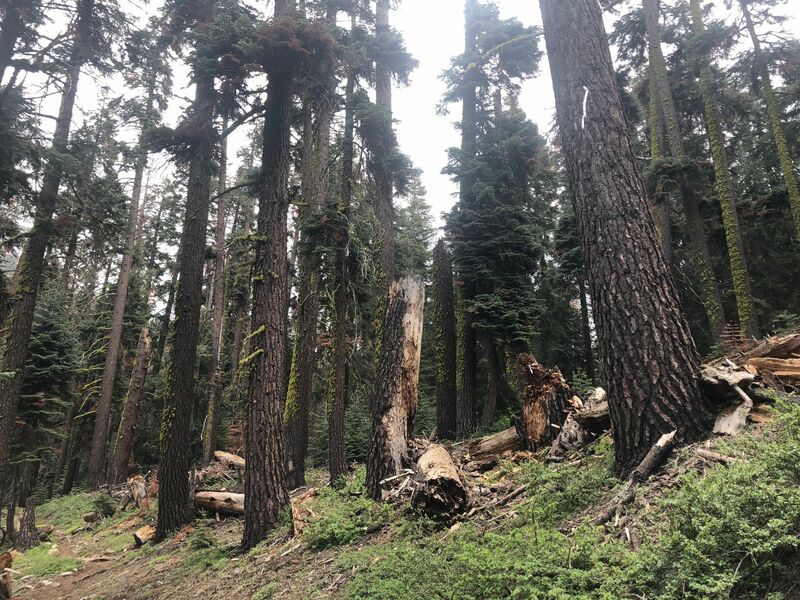 If you do this, make sure your 'smellables' are put away in your bear canister - while you're unlikely to encounter backcountry theft up here (there is constant traffic and who is going to want to carry your stuff down? ), the roving gangs of marmots will be looking for a snack. If you're lucky you'll see polemonium, or Sky Pilot, along here. A beautiful blue alpine flower, it's only found at high elevations and mixes in some color in this desolate granite terrain. There are some bivy sites around here so it is possible to camp near the junction. However, there is no water source so if you are planning on this make sure to carry all of the water you will need. Welcome to the top! At approximately 14,500 feet you are higher than any other point in the Continental United States. After traversing the west side of the Whitney Ridge, you'll follow the sloping summit plateau to the Smithsonian Hut, built in 1909 as a meteorological station and shelter. However, to quote from the NPS website: "The metal roof of this hut attracts lightning which can be conducted through the building to individuals inside. Do not seek shelter here during a storm. It is unsafe to be anywhere on top of the mountain or any exposed high place during a thunderstorm. " There is plenty of room on the summit for the crowds of people you are likely to encounter. One motivation to starting early from Guitar Lake is to avoid the dayhiker crowd on the summit - I've had the summit nearly to myself by doing this! Trail Crest is often confused with the Trail Junction (POI 2). Trail crest marks where the trail crosses the ridge and begins the descent down the eastern side of the peak. The two points are only separated by a short distance of trail. From Trail Crest, you will descend the 97 Switchbacks (yes, there are that many). You'll also be meeting the crowds climbing to the summit. Since the trail is narrow, remember that you should yield to uphill hikers (though you'll find many will welcome the opportunity for a breather). To the west, you get views of Hitchcock Lakes far below you. To the east you'll see the turquoise blue of Consultation Lake and the hazy Owen's Valley floor in the distance. On the switchbacks, you will encounter snow and ice earlier in the season. One particularly icy stretch has cables installed. This is the first opportunity to camp when descending Whitney from the western approach. It is at approximately 12,000 feet. Trail Camp is busy but some people really enjoy the socialization the camp has to offer. Water is accessible near by. Another campsite opportunity along the trail, Outpost Camp is close enough the trailhead that you'll be unlikely to set up camp here for the night. However, there is water access around here and it is another concentration of humanity along the trail. 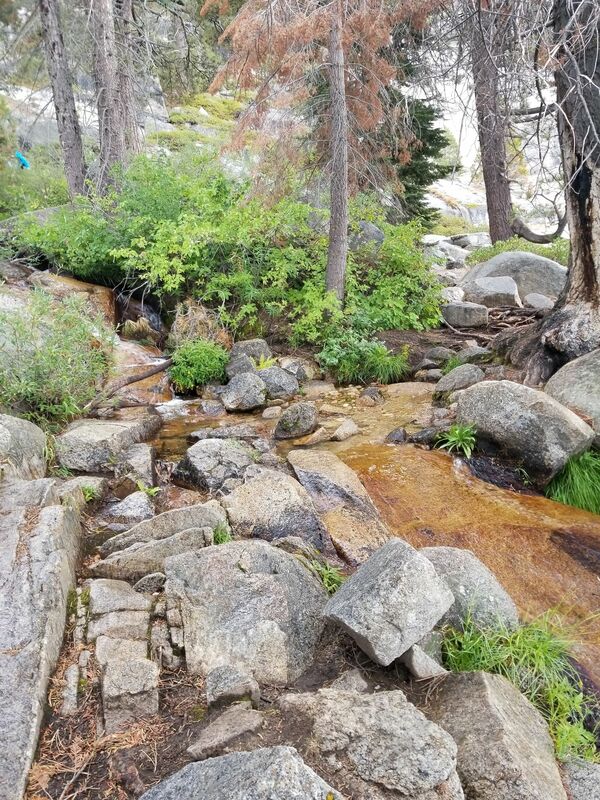 The short fork to Lone Pine Lake is a nice excursion for a water refill if necessary, but it is not often visited by High Sierra Trail hikers - after all, it's a mere few miles back to the trailhead! This usually has water, and it also marks the turnoff to the Mountaineer's route of Mount Whitney. While you won't be going this way, it's a good place to stop and notice for that return trip you're already planning on! You are done! At Whitney Portal your senses will be assaulted: noise, crowds, cars, screaming kids, barking dogs, frying burgers, cold beer. Look for the scale - weigh your pack to see how much lighter it is that the day you started out! Garbage bins and pit toilets seem like luxury. Hopefully your shuttle situation has worked itself out. Congratulate yourself on a fun trip and start planning for next year! Campsites You must camp a minimum of 2 miles from the nearest trailhead. Bears There are bears throughout this trail. Keep a close eye on all of your food and keep it packed away in the bear box or your bear canister when not in use. Photography This is a great route for wildflower and wildlife photography. 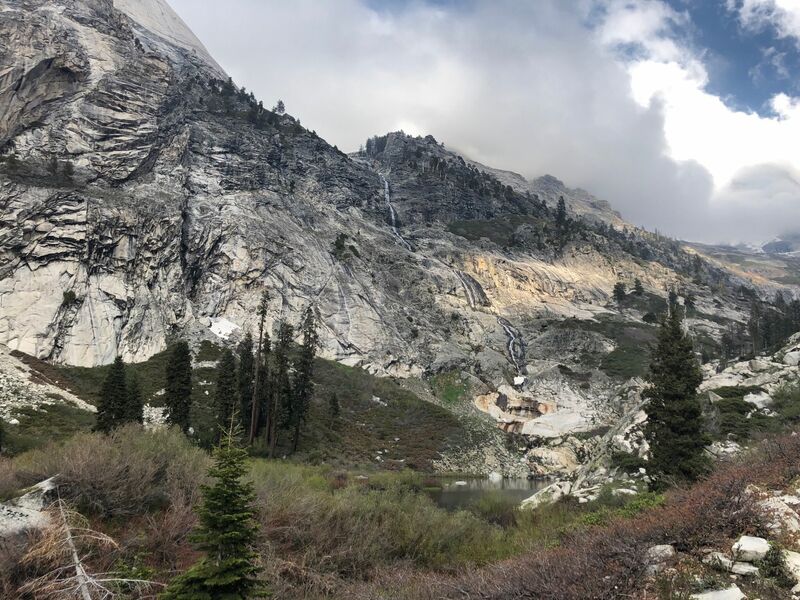 Precipice Lake was made famous by Ansel Adams and presents amazing photography opportunities - the lake has a different look and color every hour of the day. Fishing There are many fishing opportunities in the lakes and creeks throughout this trek. Check for specific regulations before heading out and enjoy some great fishing where you can. Pooping Once you pass Crabtree you will be entering the Whitney Zone. You are required to carry EVERYTHING off the trail with you when in the Whitney Zone, and that includes human you-know-what. The Forest Service provides a 'Wag Bag' kit for this free of charge, and there is a bin of them stored at the trail junction by Crabtree Meadow. Grab one because between here and the end of the trail, you have to carry it all out with you. Other This is a very long trek at elevation with a lot of climbing. It is a good idea to take it easy and pay attention to your body. As the days go on you will grow stronger and acclimate to the altitude, but day 1 can be tough. Don't over do it, and make sure to factor in the extra time it can take to shuttle, pick up the permit, and get organized at the trailhead. Directions from Ash Mountain Entrance: Drive north along Generals Highway 17 miles to the Crescent Meadow Road. Turn right and travel to the roads end and the High Sierra Trailhead. Amazing and jaw-dropping views with great history of the trail! Walk-in permits are easy to obtain. Bear boxes in almost all of the established campsites. Some campsites have outhouses. Favorite campsites: Hamilton Lakes, Moraine Lake, Kern Hot Springs, Guitar Lake. Must do hike! Hiked the HST one year ago this week. 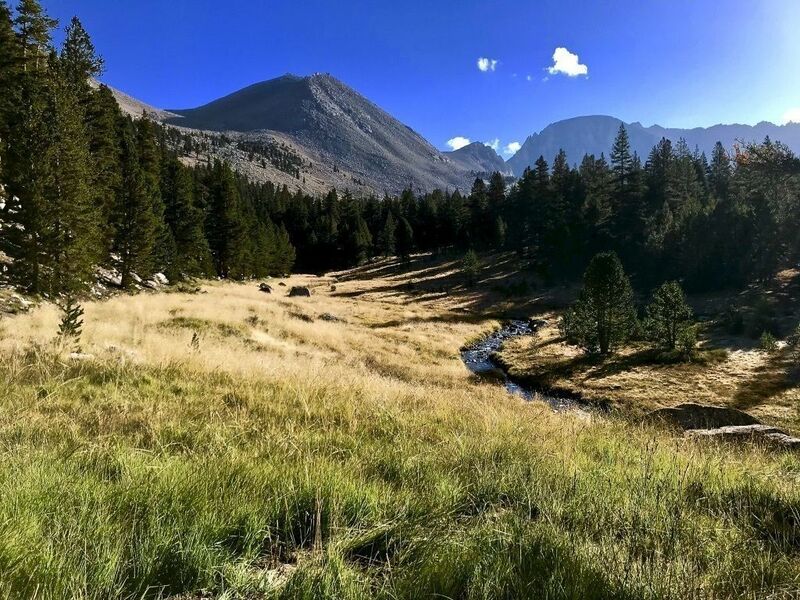 We made from Crescent Meadow to Whitney Portal in 7 days (6 nights). We had big thunderstorms with hail at Precipice Lake, Crabtree Meadow and Guitar Lake. Soaking in Kern Hot Spring was a perfect break in the middle of day 3. We did an alpine start on Whitney and got to see the sunrise and lightning across the Valley on White Mountain. I can’t think of a better way to spend a week. This trail has a little bit of everything. I especially enjoyed the numerous fly fishing opportunities along the way. We saw nine black bears on our trip. It was a great trip! I did see a bear and a rattlesnake. I do recommend stopping my Bearpaw Meadows to buy a brownie for $5. Really great hike! Definitely a challenge, but certainly doable if you're in decent shape. We took 7 days (7/14-7/20) and found that to be a good sweet spot for a challenging but not too aggressive pace. Our itinerary was: Bearpaw Meadow, Hamilton Lake, Big Arroyo, Kern Hot Springs, JMT Junction, Guitar Lake, and Whitney-Whitney Portal. There was absolutely no snow and it was easy going the whole way through. There are plenty of spots for water throughout, but bringing a bladder is recommended for those draining sunny days. A few things to note: 1) Highly recommend that you bring bug spray as mosquitoes are all over this trail. They're not unbearable, but it can be very annoying at times. 2) We ran into a couple rattlesnakes along the way, so watch your step during the day as they sunbathe on the trail or in campsites 3) Trekking poles are highly recommended for stability across all the various river crossings, slowing down for steep descents, and helping up the long ascents. Incredible hike. Did this from Crescent Meadows to Whitney Portal from 6/15-6/20 (6 days, 5 nights). Very demanding hike but no major issues in terms of stream crossings or snow. 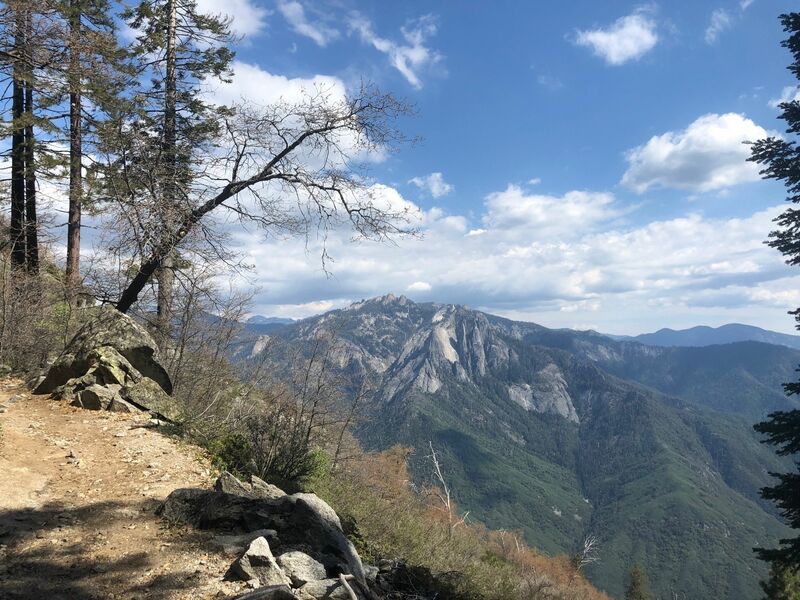 Kaweah Gap does not require snow gear, and while we used axes and spikes for a couple sections of the Whitney Trail switchbacks, the snow will likely be gone soon. The sun is very powerful and draining at these altitudes so it is best to start hiking early and bring appropriate clothing. Highly recommend for anyone looking for a challenging hike that rewards with awesome views throughout. I did only to the pass after precipice lake. As of late May, it was still fully covered with snow. You need to know what you are doing, but it was amazing. I'll come back later in the season someday! This is my all time favorite trail so far. I have only done it once but will hope to again, my son and I hiked it in 2015. We hiked in early August and the weather was excellent. Breathtaking views at every turn. The altitude is a challenge, but if you are reasonably fit and take your time you will be well adjusted by the time you summit Whitney. One of the best weeks of my life! A buddy and I began our hike late into November and we went for about 28 miles before we were caught up in a pretty good sized snowstorm that was a little too much and had to turn back. Thats what youll get when you come late into the year though. All the snow and ice aside, this trail is absolutely amazing. At least make your way up to Bearpaw, the views here are awesome! Hiked a few miles but didn’t complete. Planning on overnight camping to Crescent Meadows. Thru hiked this amazing trail in 2007, and will be doing it again next year. One of the best experiences of my life! I made a video of my HST hike on YouTube. Search for Four Feet Up, High Sierra Trail. Hope you enjoy! 09/17/17 - Beautiful hike up to Bearpaw High Sierra Camp. This trail can be challenging due to all the elevation gain and loss. The beginning and ending elevations are misleading because there's a lot of up to go down and vice versa. The trail is in good condition and well traveled but never crowded (at least when we were on it). At the lower elevations, the gnats or noseeums or whatever they are are particularly pesty. They don't bite but they fly into ears and eyes, even getting between sunglasses and skin. Having had experience with them two years ago, I came prepared this year with a mosquito net which made all the difference. We stopped for lunch halfway at Panther Creek, a beautiful spot with a lively stream and plenty of shade. There's also a nice rest spot at Buck Creek just before the final climb to Bearpaw Meadow. 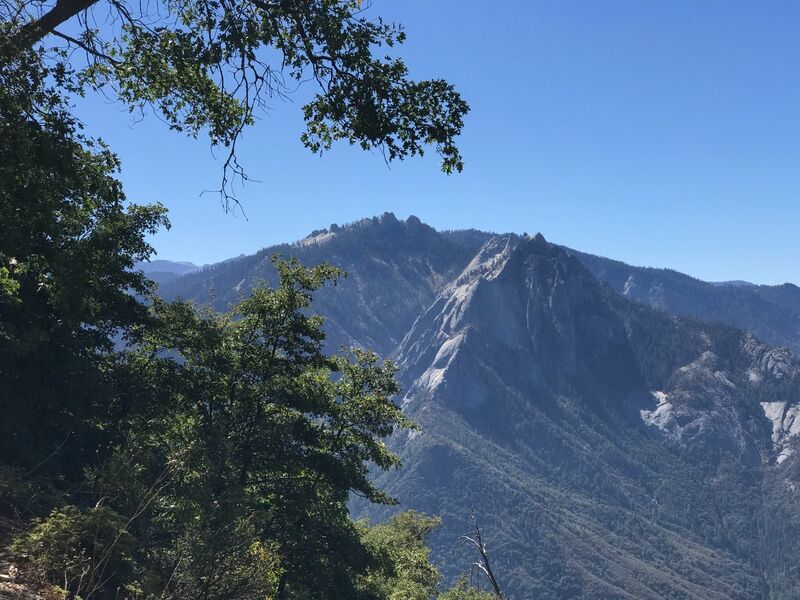 9/18/17 On our "rest" day, we hiked up towards Kaweah Gap. I made it to Precipice Lake and was quite pleased. 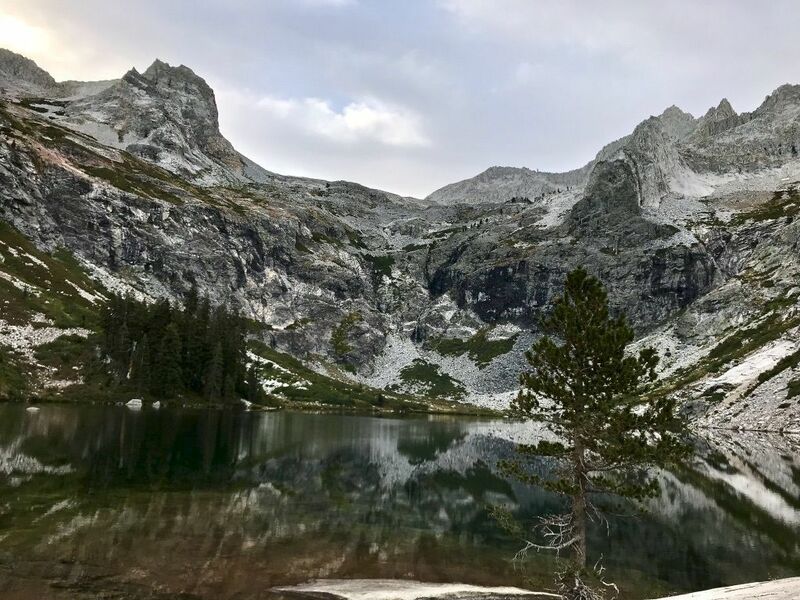 The trail climbs from Bearpaw Meadow approximately 4 miles to Hamilton Lakes, which makes a picturesque stopping point before beginning the more punishing ascent to Pine and Precipice Lakes. 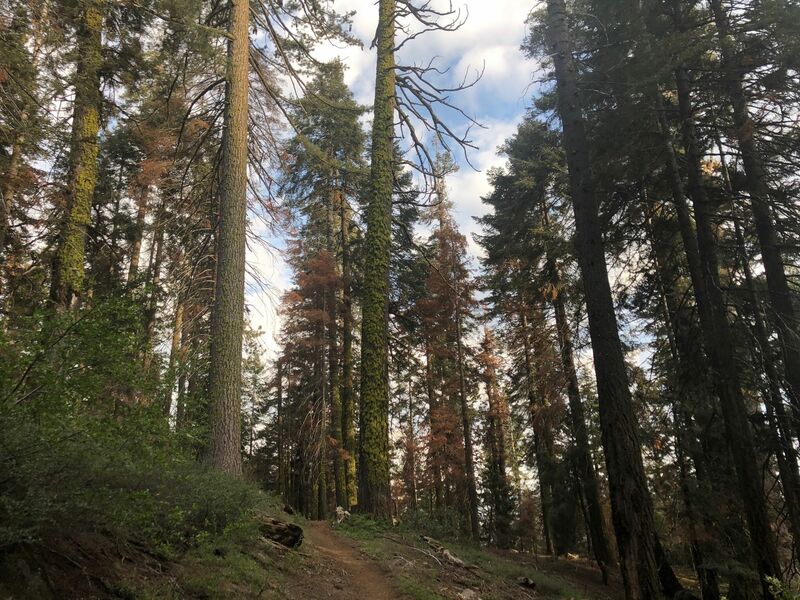 As with the 11 miles of the trail from Crescent Meadow to Bearpaw, there's a lot of up to go down and vice versa. Spectacular wide open views greet you along the way and we were lucky enough to be met by ice floes in Precipice Lake. Quite a stunning sight. The return down to Bear Paw was a long downhill with more uphill than I would have preferred. 09/19/17 - Retracing our steps back down to Crescent Meadow. A beautiful day for an 11.3 mile hike. Again, lots of up even though our final destination was down. A restful stop at Panther Creek for a snack. Encountered two horse/mule pack trains in their way up to reprovision Bearpaw and a number of hiking parties but still the trail never felt crowded. Completed Aug 2017. Whitney and Wright creek crossings dicey but everything else fab! Great views and great trail etiquette can be found immediately after departing Crescent Meadow. We just did an out-and back day hike from Crescent Meadow and it was spectacular. There is not much elevation change the first few miles, so you can put in some rather easy miles and get a variety of alpine views along the way. Keep an eye out for bears in the thick brush above and below the trail. I was a bit concerned about surprising one on this trail because of all the little turns along the mountain side. No worries as long as everyone in your group has good awareness. Great views, waterfalls, lakes, and weather. Buitifull scenery with lots of exposures. Arrived on Monday to see that it had just snowed a few inches the night before. It was insanely beautiful walking to eagle view and looking over the south side with snow still on top of the trees. we didn't do the entire trail only till bearpaw meadow. Possibly one of my favorite trails I've ever been on. Amazing views you'll never see without hiking to them! Didn't finish it due to scheduling and altitude sickness, but I will be trying again next year. Extremely beautiful trail. Lots of wildlife! Give yourself plenty of time, so that you can really enjoy it. 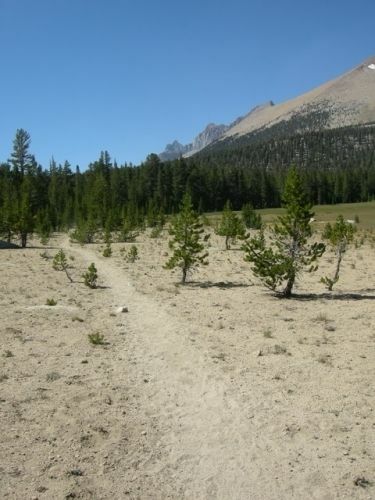 This trail begins at Crescent Meadow and culminates at the peak of Mount Whitney. Awesome trip, awesome experience. My only recommendation is take a day off the trail at Kern Hot Springs. Its at the center of the trail and will revitalize you for the next half of the hike. Time of year completed was the end of August/ beginning of September of 2015. This year marks my 50 year anniversary for hiking the High Sierra Trail. As a high school graduation gift, I asked my parents to drop me off at Crescent Meadows and pick me up in Yosemite Valley. 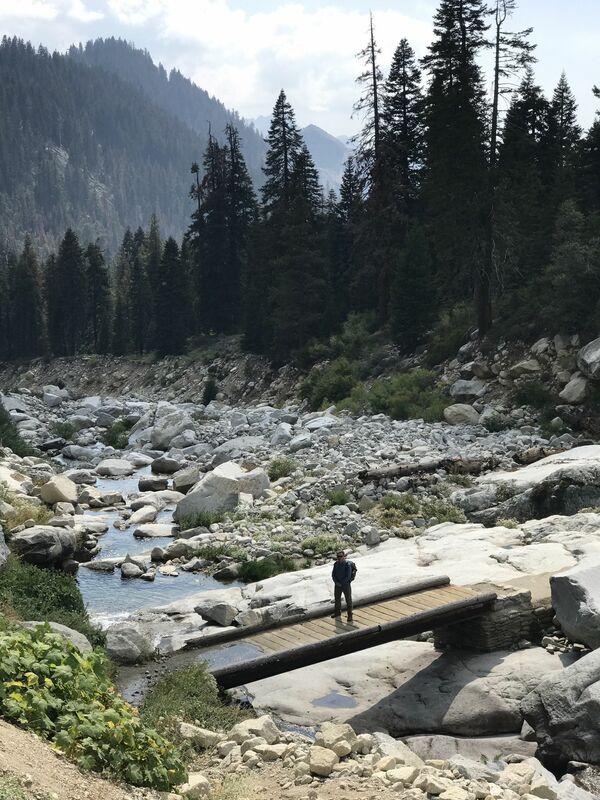 I joined the JMT at Wallace Creek, ignoring Mt. Whitney. 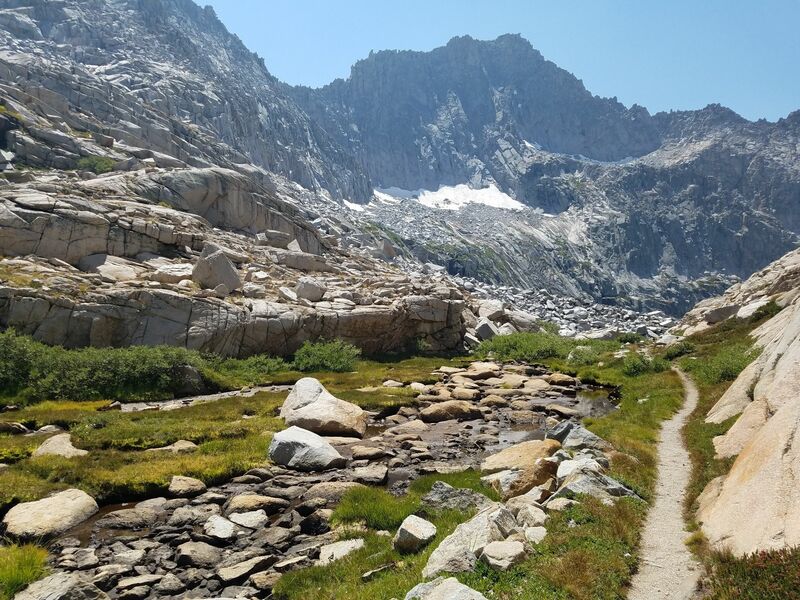 After the beauty and solitude of the High Sierra Trail, I was somewhat disappointed at the crowds on the JMT (yes, it was popular back then, and Rae Lakes as raucous as ever). I ended up hiking straight througn, never assembling my fishing rod, not reading my book, and using my stove only to make soup in the evening. I arrived in the Valley in nine days, and never again had any desire to hike the JMT again (I still have not climbed Whitney). 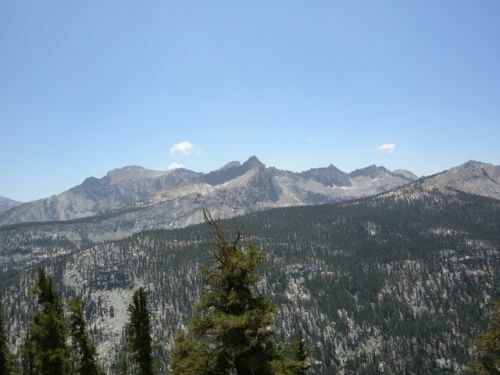 The Sierra High Route has captured my interest, and I have hiked various spectacular segments of that route. 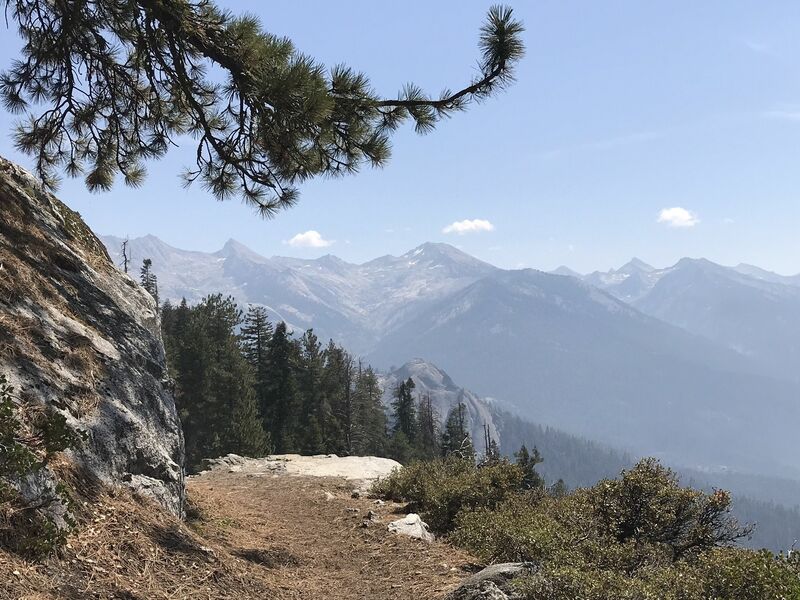 Bottom line: you can't go wrong with the High Sierra Trail. Amazing hike. Plenty of water and the views cannot be beaten! Looking for a one-week, self-guided adventure off the beaten path that you'll remember for years to come? Not a fan of crowded trails? Look no further. 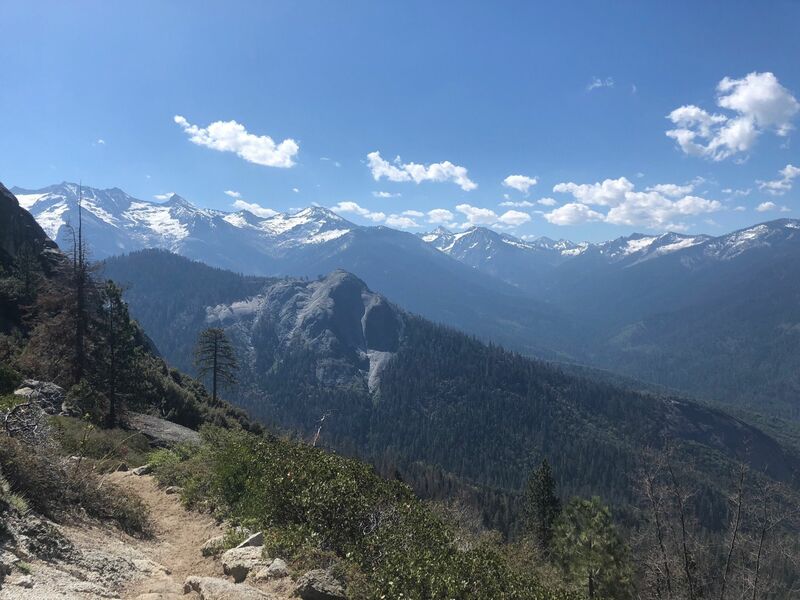 This trail manages to pack a massive number of breathtaking views and bucket-list-worthy accomplishments into a relatively short trip that still feels like a journey into the wild. 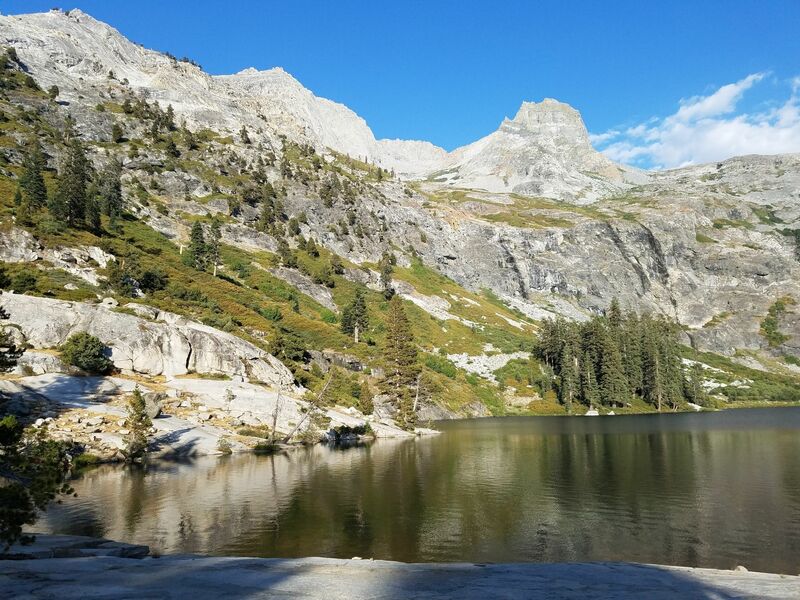 I solo-hiked the High Sierra Trail in June of 2014. Estimated stats: ~16K feet of elevation gain over ~92 miles of trail. Note that the typical route ends by exiting through Whitney Portal after summitting Mt. Whitney. I decided to extend my trip a bit and head North after Whitney and exit over Kearsarge Pass / Onion Valley. (See attached photos for a list of my trip legs, distances, approximate mileage and elevation gain). I've hiked a lot of high-elevation Eastern Sierra, but never done such a long stretch of backpacking nor so many miles. It was a humbling experience. 1. Even in drought conditions like we have in 2014, there was plenty of water along the trail at the end of June. 2. Snow was only encountered on the North side of Forester Pass, which is not part of the typical HST route. No crampons/ice axes/spikes were necessary for me, and I have very little experience hiking on snow. Some post-holing. No life-threatening drop-offs. 3. 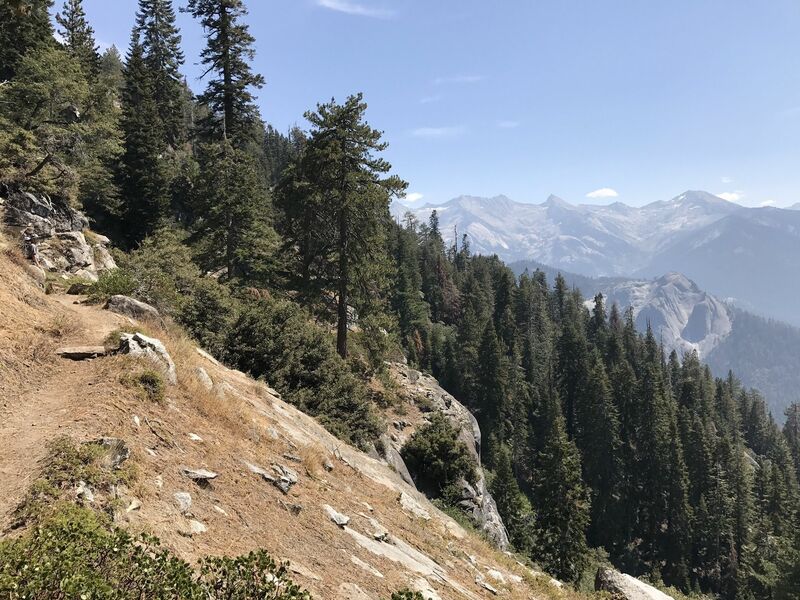 If you're afraid of heights - you're going to have trouble in several areas, beginning with hiking out of Sequoia, around Hamilton Lakes, and Mt. Whitney. 4. There are established campsites at fairly intuitive / regular intervals along the trail. You still need to take a bear canister, but it was nice to have these for convenience. 5. Whitney at sunrise: Woke up at ~12:30am, hit the trail by 1am, summitted around 4:30. Frigid. Did this trail from Jan 3 to Jan 5, 6 miles in and then out. 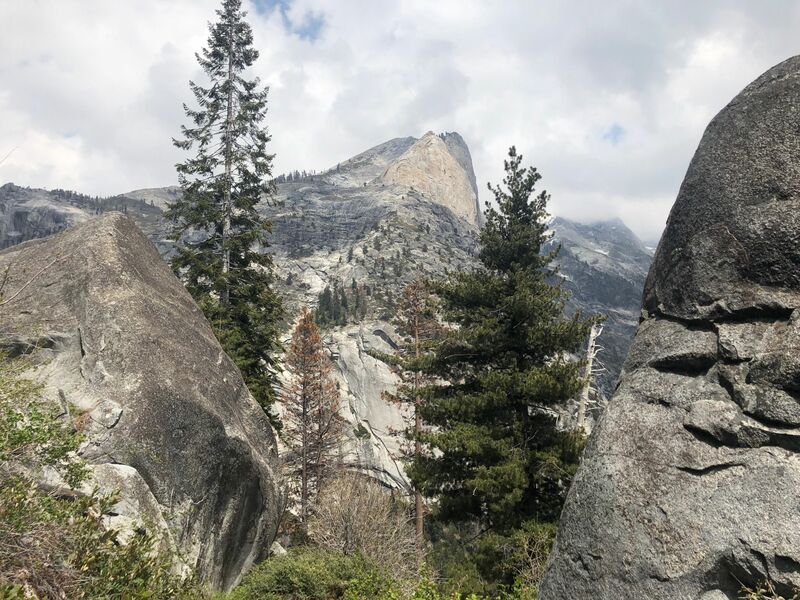 There is a set of camp sites 5.8 miles in from the Crescent Meadow trailhead that allow you to sleep on exposed rock under the stars, without obstruction. You can watch the sunset over the mountains. Really great. For Jan 3-5, we needed 30' sleeping bags, and 4 layers of clothing while sitting around. The camp sites had premade fire pits, and a food locker at the first camp site. Note that the map shown on this trail page, as of Jan 3, 2014, doesn't show the entire High Sierra Trail, just the first 12 or so miles. The summit on our 9th day to the top of Mt. Whitney started off cloudy but once we got to he summit, the clouds cleared and it was breathtaking. This was actually our longest day, 13 hours from Guitar to the summit then down the 97 switchbacks to Trail Camp on the East side where we spent the night. Our 10th day was longer than expected, and more switchbacks than we thought. But...we finally made it to Whitney Portal and had a wonderful meal of Hamburgers with cheese an bacon, an order of fries and a wonderful beer. Ahhhh. I am so glad I did this hike and encourage all to venture on to the HST. The views are just breathtaking.